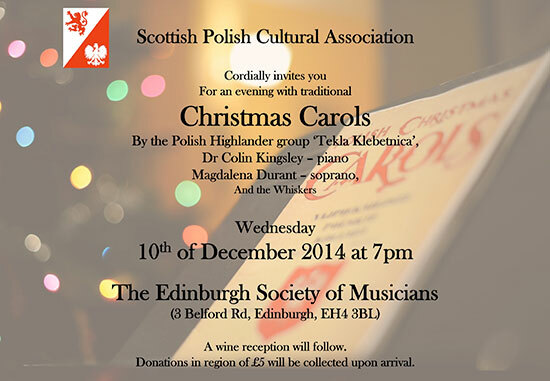 For this occasion, we are going to host the Polish Highlander group ‘Tekla Klebetnica’, who will sing wonderful Polish Christmas carols and Ms Magdalena Durant, soprano, accompanied by our Honorary President, Dr. Colin Kingsley will perform traditional British Christmas Carols. Donations in region of £5 will be collected upon arrival. Please notice, that the entrance of the Edinburgh Society of Musicians has been recently adjusted and is now also accessible for those with walking difficulties (a special chair has been installed on the staircase).